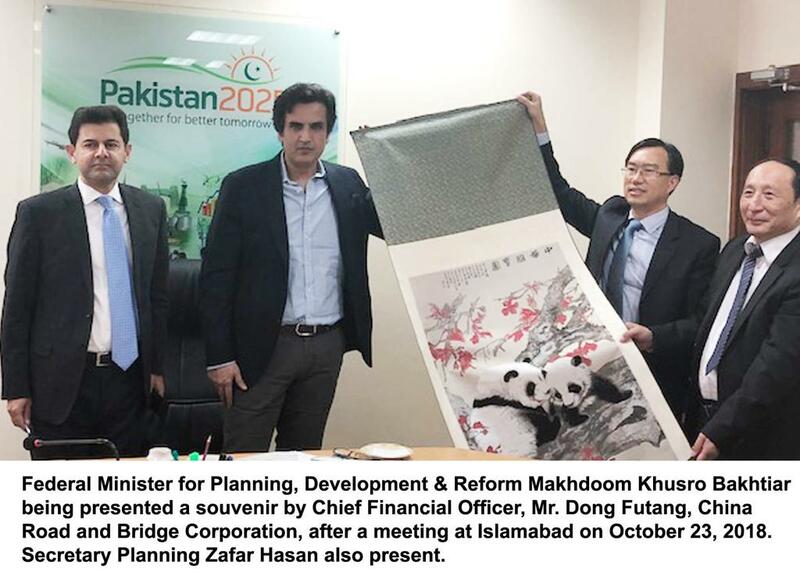 Islamabad: Oct 23, 2018: A delegation headed by Mr. Dong Futang, Chief Financial Officer, China Road and Bridge Corporation (CRBC) called on Makhdum Khusro Bakhtyar, Minister for Planning, Development & Reform (PD&R) here in Islamabad on Tuesday. 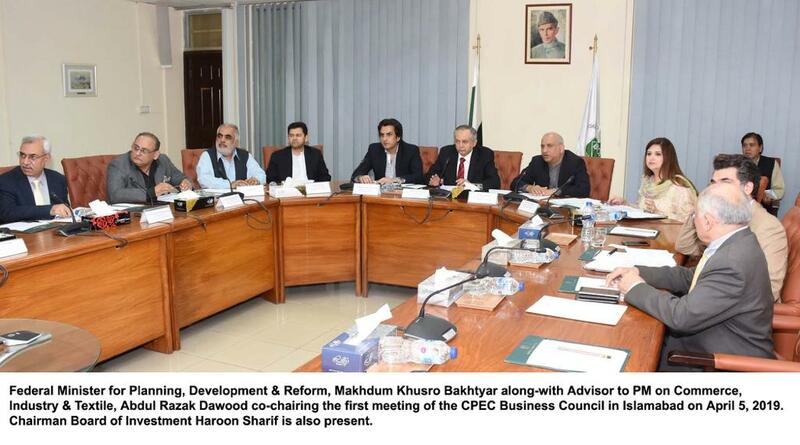 Secretary Planning, Zafar Hasan, Member Infrastructure & Connectivity, Malik Ahmad Khan, Project Director CPEC, Hassan Daud and other officials were also present on the occasion. Makhdum Khusro Bakhtyar appreciated the role of CRBC in the implementation of Karakorum Highway and other infrastructure projects. He underlined that the Chinese firm would continue its efforts to ensure efficient execution of Special Economic Zone. 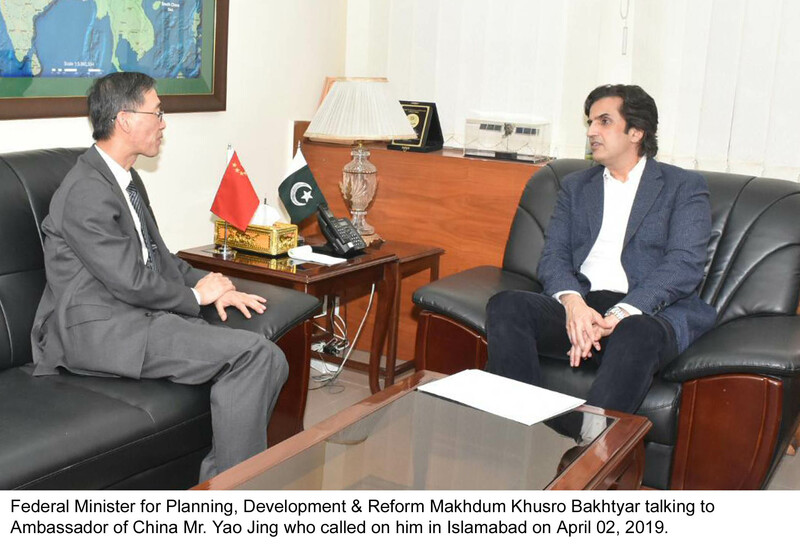 China Road and Bridge Corporation, a Chinese state-owned company has already signed a Memorandum of Understating and an engagement agreement with Khyber Pakhtunkhwa Government to jointly develop Rashakai Special Economic Zone. While highlighting the focus of the present government, Minister PD&R said, “It is our top priority to jump-start SEZs and Rashakai will be the first one.” He added that the area remained ignored in the past and none of the zones were taken off. 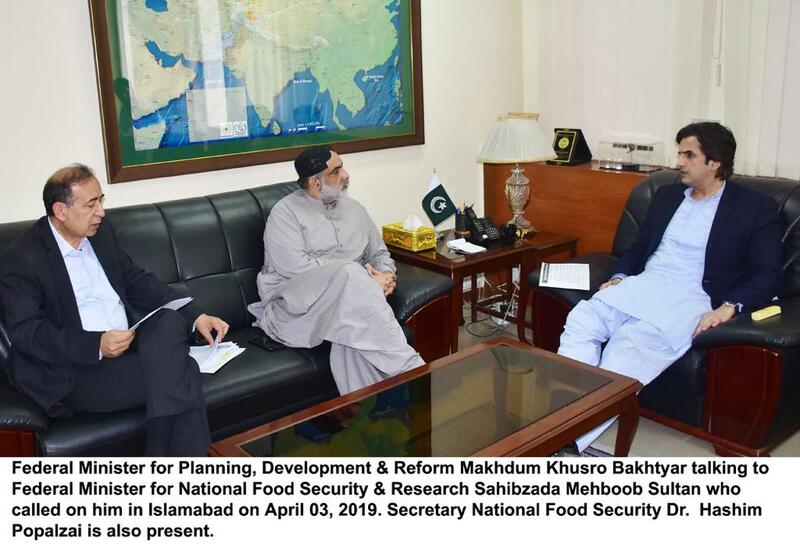 Makhdum Khusro Bakhtyar further stressed on a clear timeline and business model for the development of SEZ at Rashakai as a first zone which would be followed by others. He emphasized that the developer should focus on the relocation of Chinese heavy industry and investment from local as well as foreign enterprises to ensure value addition of the products and import substitution. 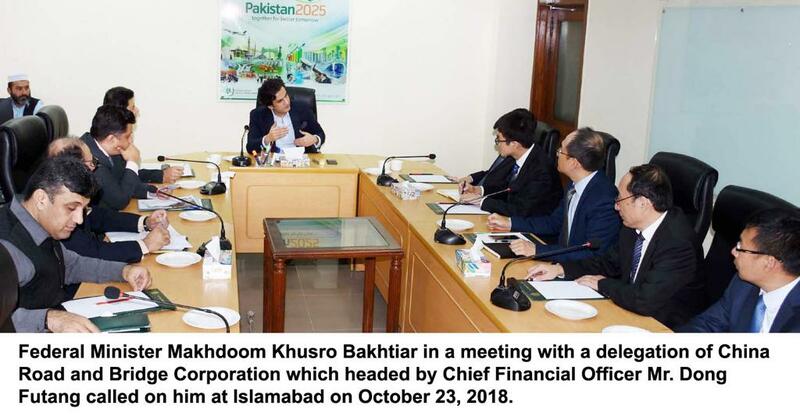 Secretary Planning, Zafar Hasan also emphasized on developing a state-of-the-art infrastructure in order to facilitate relocation of Chinese companies and ensure a level playing field for local as well as foreign investors. Mr. Dong Futang said that all out efforts and experiences would be applied to develop Rashakai SEZ at par with Chinese developed zones. He further added that locals will be preferred for employment in development and operation stages. Pakistan’s natural resource potential would be fully utilized to make this project win-win for all. اس موقع پر سیکرٹری پلاننگ ظفر حسن کا کہنا تھا کہ چینی فرم رشکئی میں جدید انفراسٹرکچر کی تعمیر ، چینی صنعتوں کی یہاں منتقلی اور مقامی صنعتکاروں کو یکساں مواقع فراہم کرنے کیلئے کوششیں جاری رکھیں، ڈونگ فی تونگ کا کہنا تھا کہ انکی کمپنی ماضی کے تجربات کو مد نظر رکھ کر رشکئی کو چینی زونز سے ہم پلہ بنانے کی کوشش کرے گی۔انہوں نے مزید کہا کہ زون کی تعمیر و آپریشن کے دوران مقامی افراد کو ملازمتوں میں ترجیح دی جائے گی، پاکستان کے قدرتی وسائل کا استعمال کرکے اس منصوبے کو پاکستان اور چین کیلئے یکساں طور مفید بنائیں گے.